There’s nothing like a fruit tree in the landscape to delight the eyes and nose with a show of springtime blossoms—and delight the taste buds with summer fruit. Selecting the right kind of landscape fruit tree to grow comes down to two main factors: the varieties of trees that grow well in your area, and your personal taste. 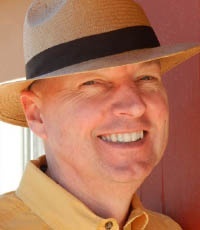 According to Ed Laivo, fruit tree specialist for Natural Hills Nursery (naturehills.com), some fruit tree varieties have proven to be dependable growers in the widest range of climates and are better than others when it comes to consistent, flavorful fruit production. The five fruit trees here will produce bushels of delicious fruit, year after year. If you think a Honeycrisp apple is great from the market, try biting into one picked from your own backyard tree! The thought of that tangy sweetness and solid crunch is probably enough to make your mouth water right now. A Honeycrisp apple is one of the best-selling fruits in food stores, and a Honeycrisp apple tree is a wise investment in your family’s health, and a great addition to any property. A flurry of pink blossoms covers the tree in early spring. Then yellowish green apples cover the tree in late summer and ripen with a red blush in September. But the fruits don’t immediately drop when ripe, so you can take your time in picking them. This variety needs full sun and well-drained soil for optimal growth. To maximize fruit production, plant another apple tree close by to aid in pollination (such as Gala, Granny Smith, Empire, McIntosh or Red Delicious). This semi-dwarf tree reaches 15 to 20 feet tall, but it can easily be held to any size with pruning to fit into virtually any yard. 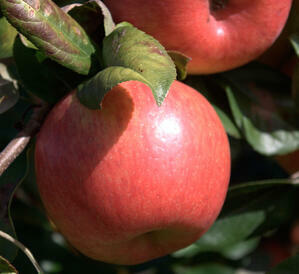 A Honeycrisp apple tree grows well in USDA Zones 4-9. A Lapins cherry is one of the largest and juiciest of the sweet cherries, making a Lapins cherry tree a great choice for backyard growing. In addition, a Lapins tree provides multi-seasonal landscape interest. In April, the tree blooms brilliant white blossoms. The fruit that follows in July is sweet, large, and dark-red to purple with light red flesh. In the autumn, the Lapins cherry tree will delight yet again with beautiful autumn color as the green leaves turn orange, yellow and red. Lapins self-fruitful and do not require a pollinator to set fruit in most regions. 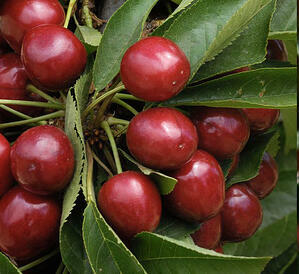 (A Lapins tree is the perfect selection as a pollinator for other cherry tree varieties.) The large cherries are one inch across, and the flexible skin resists splitting. The flavor is divine—often referred to a Bing-like—and is both juicy and sweet. The fruits are delicious right off the tree and wonderful for baking, juicing or drying. The Lapins tree is a cross between a Van cherry and a Stella cherry and is cold hardy to -20° F. It is also well adapted to warmer coastal climates. 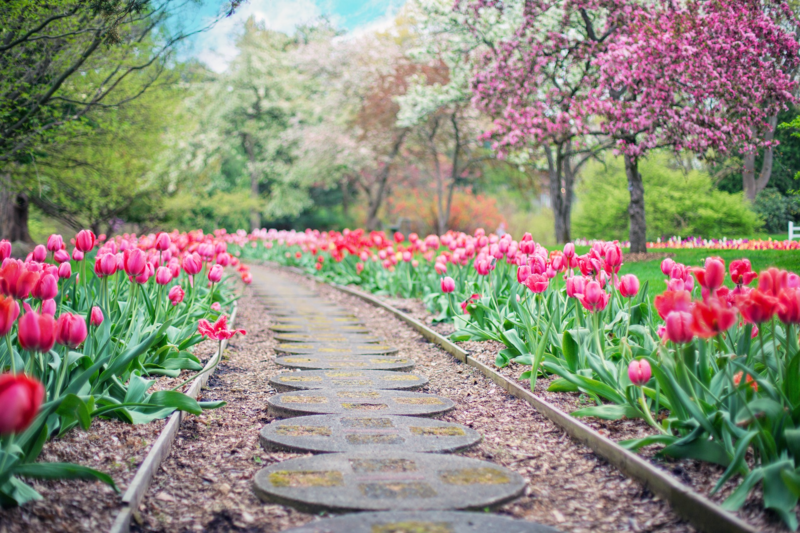 Choose a location with full sun and soil that holds moisture without becoming soggy. The tree grows to 20 feet feet high but can be pruned to fit smaller spaces. The Harken peach tree is best known for its superior quality of mid-season peaches. Harken bears a regular crop of top-rated freestone peaches suitable for fresh eating, canning, and baking. Each delightfully fuzzy, large peach has bright red and yellow-mottled skin. The flesh is yellow, very sweet, and resists browning. For optimal storage, pick the fruit just before it is table ripe. The Harken peach tree is admired almost as much for its beauty and fragrant blossoms as it is for fruit. The delicate peach blossoms appear in late winter or early spring along the grey branches, even before leaves emerge. Harken peach is an extremely vigorous tree, attaining a mature size of about 18 feet with an equal spread. Noted for its fruit production in areas with lots of spring rain, the tree is adapted to USDA zones 5-9. Harken is self-fruitful, so you can start with just one tree. 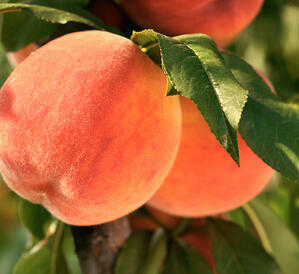 Harken Peach is an outstanding choice for a lovely fruit tree that produces exceptionally delicious peaches. It’s not often you get a fruit that is praised by the likes of Alice Waters, Martha Stewart, and Oprah Winfrey as the most delicious pear in the world. Celebrity testimonials are just one reason the Warren Pear is sought after. Warren Pear is an outstanding semi-dwarf pear tree that brings a late summer harvest of sweet, juicy fruit even in areas where pears are traditionally difficult to grow. Originally found in a neglected orchard in Mississippi, these hardy trees are resistant to fire-blight and other diseases that so often plague pears in warm winter areas. The medium sized, yellow fruit has a lively green tint and an occasional red blush. The pears are beautiful dangling amid the sturdy upright branches. 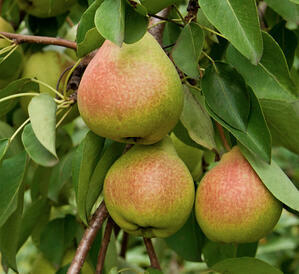 This is one of the finest-flavored pears available for home growing. Warren Pear grows in USDA zones 5-10. As one of the most widely planted plum varieties, the Santa Rosa has become the standard by which all others are judged. Plant one in the front yard where your friends and neighbors can share in the beauty of its blooms and the abundance of fruit. Lovely pink and white blossoms set the stage in springtime for the Santa Rosa’s delectable harvest in late July or August. The red-hued, purple skin of these plums conceals a layer of red blush, then sweet, yellow flesh surrounding the center pit. The medium-large, slightly firm plums are perfect for canning, freezing, cooking, drying—or eating right off the tree. Santa Rosa’s flavor is sweet with a slight tangy edge. 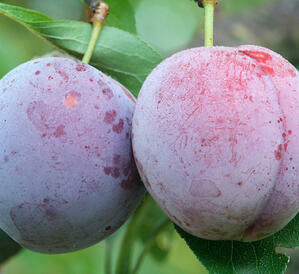 Santa Rosa plum trees grow 15-25 feet high, but can be held to any size with pruning. It’s a relatively hardy tree and is particularly adapted to areas with hot summer temperatures. It’s self-fruitful, so there’s no need to plant another plum tree nearby. Santa Rosa is quite often the recommended pollinizer for many popular plum varieties. For more information about the wide variety of fruit trees, shade trees and shrubs available for growing, visit NatureHills.com.